Welcome to Sonig Shih Tzu's. My Dogs are not just Dogs, they are my Family and my Heart. We have been showing and breeding Shih Tzu's since 1988.After being fascinated with this clown like little dogs with a appetite for fun. After all who can resist those beautiful soft dark eyes looking up at you. Our first European Champion was AMING SINGLI MAREVEL’S who was a son of a World Champion …..and the rest is a history…. 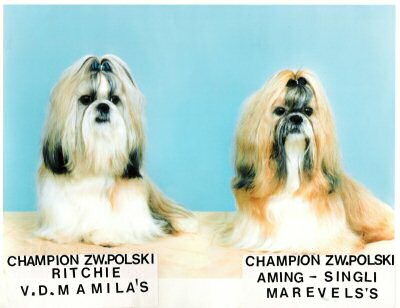 We at Sonig Shih Tzu's dedicate ourselves in breeding and exhibiting only the best quality dogs and always doing well Under Local, Interstate and International Judges. We continued to breed sound well balanced pups with lovely heads, beautiful coats, good movement and temperament. We currently have available puppies, please contact Polish Shih-tzu club . ……… as they are all registered there. We are located just outside of Poznan, where we have big garden and the best facilities for our dogs to achieve the best possible development.